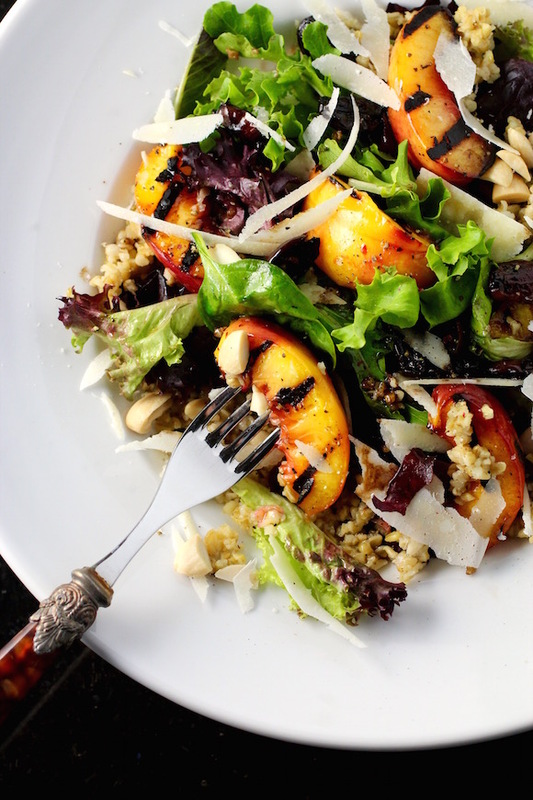 Subtle smoky flavors and the pleasant chewy texture of freekeh, a tasty whole grain from the Middle East, complement the smoky-sweet grilled nectarines in this super-satisfying barely-warm entree salad. Rough chopped Marcona almonds and shards of Parmesan bring nutty-buttery components. It’s all pulled together by the dressing in which Kalamata olives are fried in olive oil then balsamic vinegar is added and reduced to a syrup. Fresh ground black pepper finishes it off. Green soft durum wheat is harvested young, then roasted over an open fire during which the straw and chaff are burned, then rubbed off, leaving a complex tasting grain with earthy grassy herbal overtones. Cracked freekeh cooks up in about 20 minutes and has three times as much fiber as brown rice. While it makes a superb side dish pilaf-style, or even as a hot breakfast cereal-style – freekeh is especially great tossed up with mixed greens, olive oil, and salt – then paired with fruit and nuts in a salad such as this.